A plane flies over the Rice Ridge Fire near Seeley Lake, MT, August 8, 2017. Since before the smoke from the Rice Ridge Fire cleared in 2017, a team of University of Montana researchers have been tracking lung health of local residents. They presented their early findings to the Seeley Lake Community Council for the first time Monday night. "We're a little amazed by the results a year out. I did not expect there to be an effect a year out," says Chris Migliaccio, a researcher at UM’s school of pharmacy. He says people’s lung function was worse a year after the fire than it was directly after breathing some of the highest measured wildfire smoke levels ever recorded. "I expected that the lung function results would be the lowest immediately after 50 days of smoke inhalation, and that given a year, it would give people that much time to rebound and start getting back to normal." But people’s lungs didn’t rebound. They got worse. 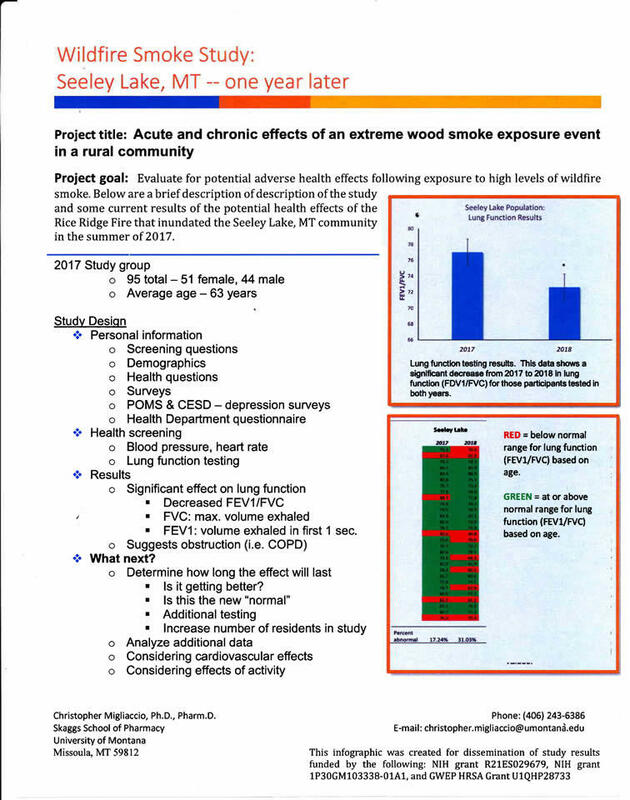 Migliaccio says he was asked by the Missoula City-County Health Department to do a study after Seeley Lake air quality monitors measured fifty days of “unhealthy” levels of tiny particulate matter, or PM2.5, found in wildfire smoke during the Rice Ridge Fire. These particulates accumulate when you breathe them in, which can lead to cardiovascular and respiratory issues. Migliaccio surveyed 95 people at the end of the 2017 fire season, men and women ranging from their 20s to 80s. The average age was 63. He asked them questions about their demographics and health, took their blood pressure and heart rate, and tested their lung function with a spirometer. About a third of his original subjects came back for similar tests the next year. "Almost everybody, 90 percent of the people that came back to be tested, all their lung function dropped. One person didn't change at all, and two people slightly increased." He says a number of people registered results below what’s considered normal for their age group a year after the fire, and that men were more impacted than women. He says people might not notice a difference in their ability to get around now compared to before the fire, and his study only measured an objective assessment of lung function, not how people felt. Migliaccio says he jumped at the chance to study a cohort of people impacted by wildfire smoke in real time. He says typically, researchers check in with hospitals after a fire and look for upticks in lung- or heart-related visits. "They don't do studies on individuals like we did here where we're actually following individuals, following exposure, seeing what their health is like." Migliaccio is still accepting new participants from Seeley Lake to add to his ongoing study. He’s starting similar study cohorts in Hamilton and Thompson Falls, and hopes to secure grant funding for future studies in Missoula and a control group in eastern Montana. The Seeley Lake study, which Migliaccio wanted to present to locals before seeking publication in a peer-reviewed scientific journal, raises a number of questions for him and his colleagues at UM. "Is this the new normal? Is this a downward trend? Or are we going to see people rebounding; because we didn't really have any smoke this past summer. So we don't know. But we did see that from that exposure that there were lingering effects even a year out." 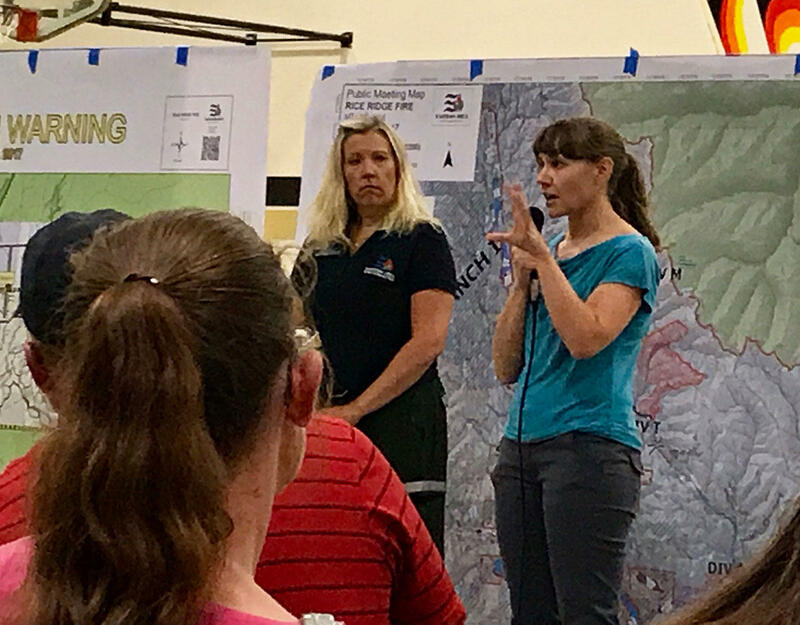 Sarah Coefield from the Missoula City-County Health Department talks about the hazards of the smoke in Seeley Lake at a public meeting Thursday, August 10, 2017. He says he and other UM researchers want to look at how exercise in smoke-affected areas relates to exposure risk and recovery, and how prolonged wildfire smoke exposure impacts the heart. Not everyone in Seeley Lake was as surprised as Migliaccio with his findings. Councilman Cecil Schlabach teaches middle school at Seeley Lake Elementary. "In the springtime, it really seemed like the springtime — I saw more hacking, coughing up a lung than I did immediately as the fire was going on." Janet Whitesall says she stuck around for the entirety of the Rice Ridge Fire and felt fine, even without using HEPA filters. But hearing Migliaccio’s study results makes her think twice about her wood stove. "I'm real concerned about it now in the winter if what happened over the summer had that big of an effect on people. And I felt no symptoms at all during the fire, but I do now with wood-burning season. Kind of an eye opener." To contact Dr. Migliaccio, send an email to christopher.migliaccio@umontana.edu. Stay up to date with his study here. The federal government has denied Montana’s request for $44 million dollars in disaster funding following the historic 2017 fire season that burned over a million acres across the state.